One of the most common questions I receive from African American men deals with razor bumps. It is estimated that up to 80% of African American men suffer from razor bumps at some point during their lives. Razor bumps, also called Pseudofollicultis Barbae, can occur in any area that hair is temporarily removed by shaving, waxing or tweezing. These painful bumps and pustules occur when hairs curl back into the skin causing your body to perceive them as “foreignâ€ (like a splinter) and produce an inflammatory response. This inflammation can cause bumps, pus, discoloration and keloidal scars. As every man cannot wear a full beard as well as James Harden or George Clooney, there are many who desire a more conservative look. For those that “fear the beard,â€ the prospect of razor bumps can be daunting. Here are a few tips to help put the bumps to rest and keep you smooth, neat and office-ready. 1. Don’t cut hair too closely. Focus on looking “clean-shaven,â€ not necessarily feeling “silky smooth.â€ If using a razor can be avoided, use electric clippers to trim hair to about a millimeter in length. This is short enough to be considered office appropriate and keeps bumps at bay. a. Do not repeatedly shave the same area. Do not stretch or pull skin while shaving. b. Shave while your hair is wet and use a moisturizing shaving cream or gel. Softening and hydrating the hair allows the razor to cut the hair cleanly with less force causing less irritation and reducing irregularly cut hairs that are prone to becoming ingrown. c. Shave at least every 3 days to reduce the time hairs have to grow and curl back into the skin. 3. Use proper post-shaving care. a. 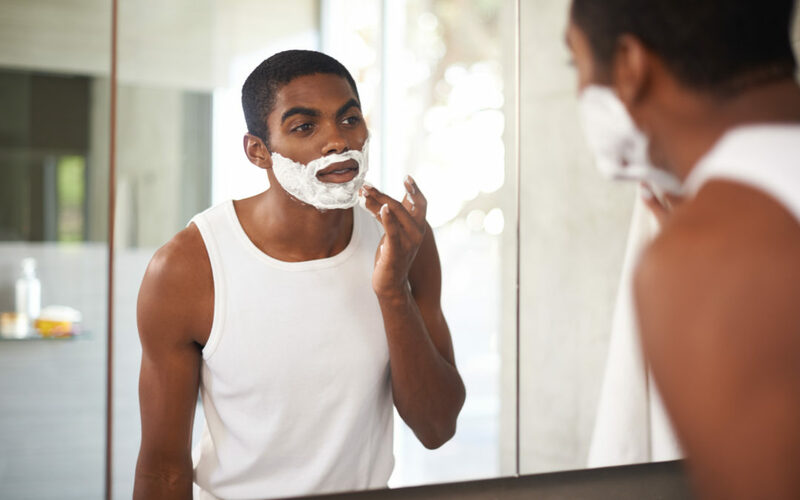 Starting 1 day after shaving, use a soft bristle brush, wash cloth or Buf- Puf (ask a female friend about it) to gently massage the face and neck at night to help remove and loosen dead skin and hairs to keep them from curling back into the skin after shaving. b. Alternatively, use a daily moisturizing product that contains salicylic acid or glycolic acid to gently exfoliate the skin and keep hairs growing in the right direction. I like Tend Skin and Ingrown Eliminating pads by Bliss. They both also contain many moisturizers and soothing agents. Remember to see product instructions regarding how soon the product should be applied after shaving. 1. Avoid shaving until all bumps have healed. Remove ingrown hairs by gently inserting a toothpick or sterile needle under the hair loop and releasing it. Do not pluck. Using warm compresses can help soothe discomfort and open pores. 2. See a board certified dermatologist. I often prescribe a combination of an antibiotic gel and a topical steroid or retinoid (Tazorac or Retin-A) for moderate cases. Oral antibiotics can be effective in the right patient. Eflornithine cream can also be prescribed to reduce hair growth; however, it takes many weeks to see an effect and must be used indefinitely. Intralesional steroid injections can be used to treat keloidal or hypertrophic scars. In severe cases, laser hair reduction using a Diode or Nd:YAG laser can be curative. I have had great results with both. Most importantly, be patient and remember that razor bumps are stubborn annoyances that can last for many weeks but in most cases will resolve. With a little preparation and by employing consistent, healthy skin care techniques, you can stop them before they begin. Michelle Henry M.D. is board certified Dermatologist. She is currently finishing a fellowship in Mohs, Reconstructive and Laser Surgery at Harvard Medical School. Her areas of specialization include: skin of color, skin cancer management, Mohs surgery, reconstructive and cosmetic surgery. She plans to return to the New York area to practice this summer.